The Bible contains thousands of names, dates, cities, rulers, genealogies, events, and scientific facts. Name one thing that has been proven wrong in the Bible. While you're thinking, let me remind you that archeology continually affirms the Bible, and has not yet contradicted a single thing. Consider just a few of these facts here. But other than that this picture is spot on. The truth is, gravity is not "just a theory." It used to be. 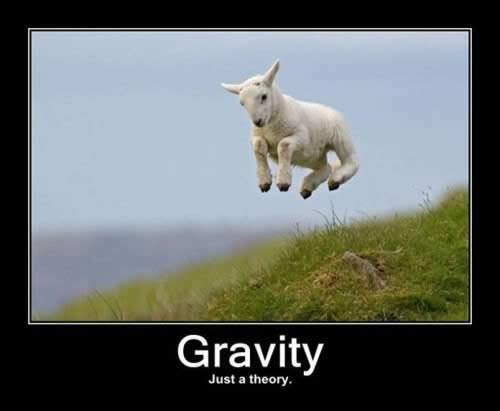 Now it is called the "law of gravity" because evidence has proven the theory. Evolution is still "just a theory" because there is no evidence to prove it. Even what Darwin himself said was necessary to confirm his theory has not happened. Honestly, "theory" is quite a compliment. In light of the lack of provable data, "science fiction" is more accurate. That's funny. The Bible actually said that the earth is round and suspended in space centuries before it was proven to be. Once again, the science confirmed the Bible, not evolution. He stretches out the north over empty space. So who is it that doesn't understand what (or Who) controls the universe? As I have noted in the past, one suggestion that really bothers me is the one that asserts that evolutionists have all the brilliant minds on their side while Creationists get the ones too weak-minded to make it in academia. Darwinists act as if their team has all the jocks while we get the rejects, the ones not picked to play the game. One of the weapons in their arsenal of demonizing our side is the “comfort of religion” missile. The way this one works is by pointing to our belief in God as a crutch—as something we lean on because we are too scared to come to grips with the fact that we, and life, are meaningless. So we are said to be holding onto our precious comfort of religion like a child desperately contending that Santa Claus is real, even though he is beginning to see evidence to the contrary. We lay our heads on our collective pillow, and finally drift off to sleep comforting ourselves with our religion. Apparently when Kurts thinks of Jesus, he thinks “long-forgotten historical figure.” Apparently Jesus’ millions of followers over 2,000 years are not enough for Kurtz. But beyond that, notice what Kurtz is claiming: that it is our creative human imaginations that have created this belief system; it is our defense mechanism for coping in this world. To carry Kurtz’s point out, if we would just do away with our make believe playtime, then we would finally come to terms with evolution and atheism. 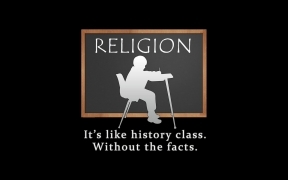 So we shrug off the truth of atheism in order to be comforted by our imaginary religion. 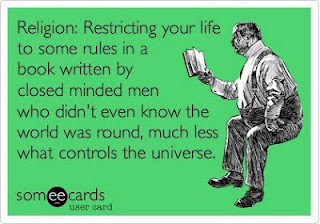 I have written many articles refuting the notion that there is any truth to atheism/evolution, so I won’t do that here. But comfort of religion? This idea would only sound good if Christians enjoyed problem-free lives, or if the Bible painted God as a fluffy teddy bear. Did Jesus have the comfort of religion in the Garden of Gethsemane or on the cross of Calvary? Did Paul have the comfort of religion when he was shipwrecked, beaten, snake bit, imprisoned, and beheaded? Did Peter have the comfort of religion when he was crucified upside down? Or when the other apostles were all killed for their faith? Do the 165,000 Christians who are martyred worldwide each year have the comfort of religion? Do the Chinese believers who have their tongues cut off for teaching the Bible have the comfort of religion? Did the Bible translators who were burned at the stake have the comfort of religion? Jesus promised that the Holy Spirit would be our Comforter, but He did not promise us an easy, pain-free life. So what comfort are we supposedly clinging to? It appears to me it is the atheist that is clinging to comfort as he soothes himself with his pseudo-science, assuring himself that there is no God, Lord, or Judge. I think the fact that so many people cling to God’s Word despite the persecution shows that religion is not for the weak; rather, history is filled with accounts of people bravely using their final words to appeal to their executioners to give their hearts to the Lord. If I were faced with choosing the comfort of religion or the truth of atheism, I suppose I too would sacrifice the latter, but only because there is no truth in atheism. Unexpected Love by Julie Zine Coleman is a study on “God’s heart revealed in Jesus’ conversations with women.” The book explores nine conversations that Jesus had with women during His earthly ministry; these women are Jesus’ mother, the woman with the issue of blood, the woman who anointed Jesus’ feet with her hair, the Syrophoenician woman, the woman caught in adultery, Martha, the woman at the well, Salome, and Mary Magdalene. Each chapter begins with the actual text from Scripture written out, then the author’s paraphrase of the event. I really appreciated that the Scriptural account came first, which allowed any reader not familiar with the Bible to see the biblical record first, then see the author’s thoughts. Julie’s gift for writing clearly comes through in her paraphrase of these events. After the story is set up there is a Digging Deeper section where it is obvious that the author has done an immense amount of study. In this section she includes details gathered from outside sources such as the Talmud, Josephus, and early church fathers and historians. 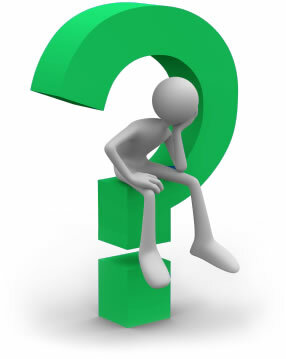 The next section of each chapter is a list of questions. These questions are ones that the reader may find herself wondering without even realizing it, and then they are clearly answered. Finally, each chapter ends with some Food for Thought—some additional points to ponder—as well as a Journaling section for those who choose to do so. This book is written to women, but as a man I gained so much from it. 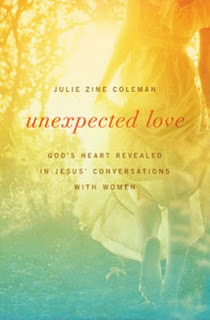 I highly recommend this book to both women and men who want to dig deep into these nine events from Scripture. It is also a powerful argument for the nonbeliever who thinks that Christianity is a boys’ club or amale-dominated religion. Haeckel sketched the development of several species from embryo to adulthood. He traced the development of a salamander, fish, turtle, rabbit, chick, hog, calf, and human. 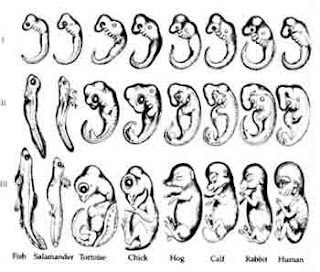 The point of the chart was clear: to prove common ancestry by showing the similarities among each study in the embryonic stage. Haeckel’s theory was that human embryos replay each stage of the evolutionary process before becoming human. We now know that his sketches were fake. Even his peers accused him of fraud. Not only was he a liar, he was wrong. His theory, which he called “ontogeny recapitulates phylogeny,” has also been scientifically debunked. And yet his theory is used to justify abortion and embryonic stem cell research. His sketches also continue to appear in textbooks. Our students are being told that evolution is true, and this is being reinforced by fraudulent, inaccurate sketches.